Stretching across seven kilometres of coast, Doha is fast becoming one of the world’s most popular business and tourist destinations. The city has transformed over the past decade, with the skyline increasingly dominated by stylish new hotels and an ever-expanding commercial district. The opening of Hamad International Airport in 2014 has only hastened this growth; Doha now acts as a global gateway, connecting European travellers to the Far East in just four hours. Strategically situated in the centre of Doha’s aptly named Education City – which acts as Qatar’s hub for innovation and drives connectivity between the country’s businesses and universities – the Qatar National Convention Centre (QNCC) is a modern architectural phenomenon, and one of the most sophisticated MICE venues in the world. 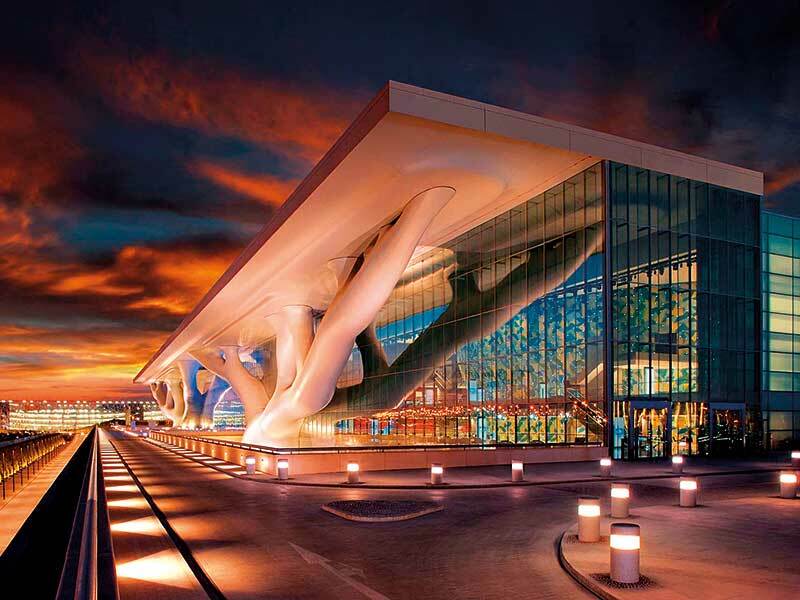 Designed by renowned Japanese architect Arata Isozaki and inspired by Qatar’s beloved icon, the sidra tree, QNCC boasts a striking facade and an equally impressive interior. The facility was purposely built to achieve the gold environmental certification standard, making it one of the most sustainable buildings in the Middle East. Covering a total of 200,000sq m, the centre’s sheer magnitude makes it ideal for concerts, banquet functions, weddings and theatrical productions, while the subtle intimacy of its internal spaces is perfect for meetings, exhibitions, seminars and business events. Along with 52 meeting rooms of varying size, the venue offers a stunning 2,300-seat theatre, nine large multi-purpose halls with 40,000sq m of indoor and outdoor column-free space, three magnificent auditoria, and a standalone conference hall, which can house 4,000 delegates and is adorned by 28 marvellous Swarovski crystal chandeliers. Cutting a striking figure at the very heart of QNCC is world-famous artist Louise Bourgeois’ Maman, a 30ft high and 33ft wide metallic spider. Donated by the Qatar Museums Authority, the sculpture doubles as the perfect conversation piece and is often a favoured rendezvous point, with guests regularly prompting associates to “meet at the spider”. Built to facilitate all types of events – ranging from high-profile conferences and exhibitions to international theatrical productions – QNCC delivers world-class AV, rigging and exhibition support, along with a full spectrum of telecommunications, internet and wireless communication services. But it is not just the convention centre’s remarkable facilities that have garnered international acclaim. QNCC has built a reputation for providing a whole host of integrated services to each of its clients. This is reflected in the centre’s accommodating workforce, which includes an experienced team of event professionals willing to go above and beyond to provide every guest with a memorable and holistic experience. Capable of meeting any specific event requirements, the centre’s talented team of chefs operate the fully equipped QNCC kitchens, offering a range of conference lunches, gala dinners and ‘grab to go’ options for those on the move. With so much to offer in the way of facilities and services, it is easy to see why QNCC has secured such an outstanding reputation within the region and beyond. The unique environment the centre has crafted since opening its doors in 2011 gives it the ability to host any type of function, and has made it a natural choice for any event organiser seeking the perfect MICE destination.